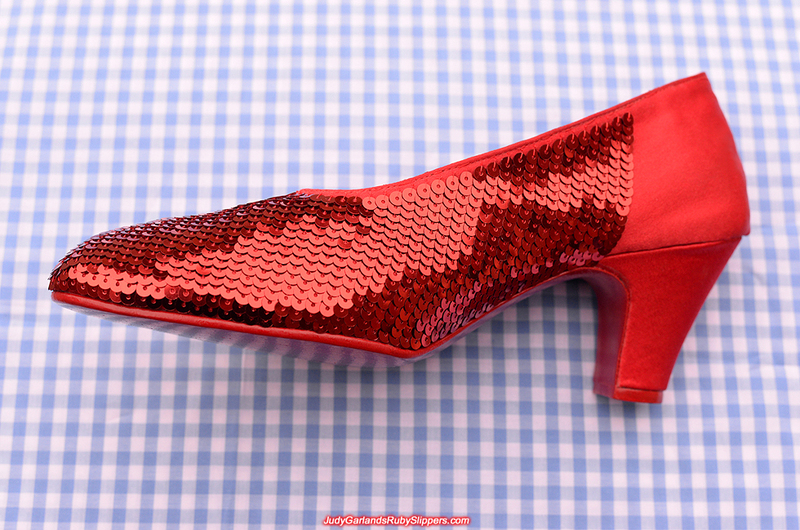 We are making a high quality pair of ruby slippers in women's size 8 for a lovely lady. 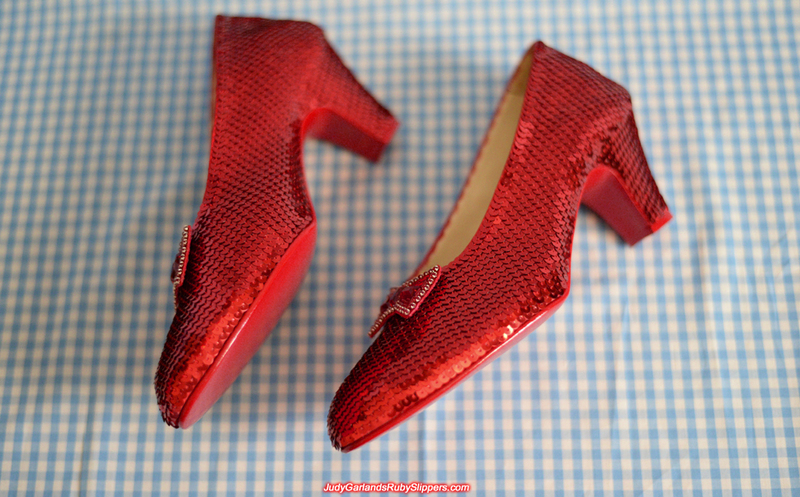 For the record, Judy Garland as Dorothy wore a size 5 so this pair will be a bit bigger. 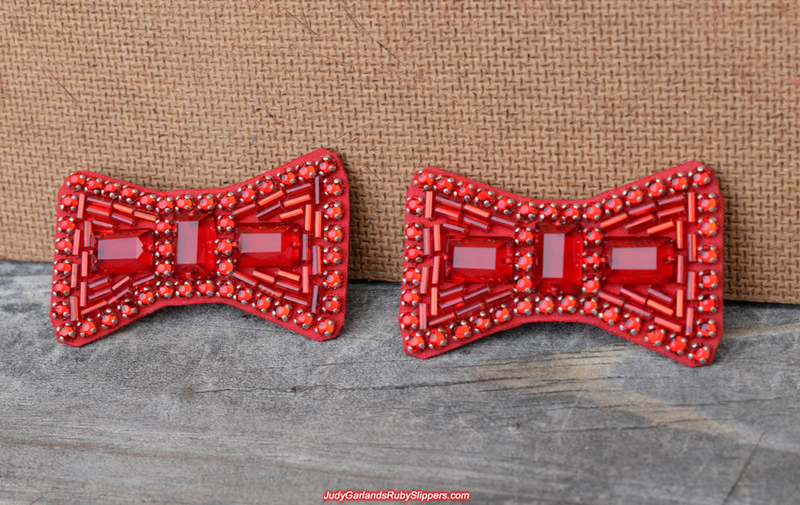 We made a beautiful pair of bows. 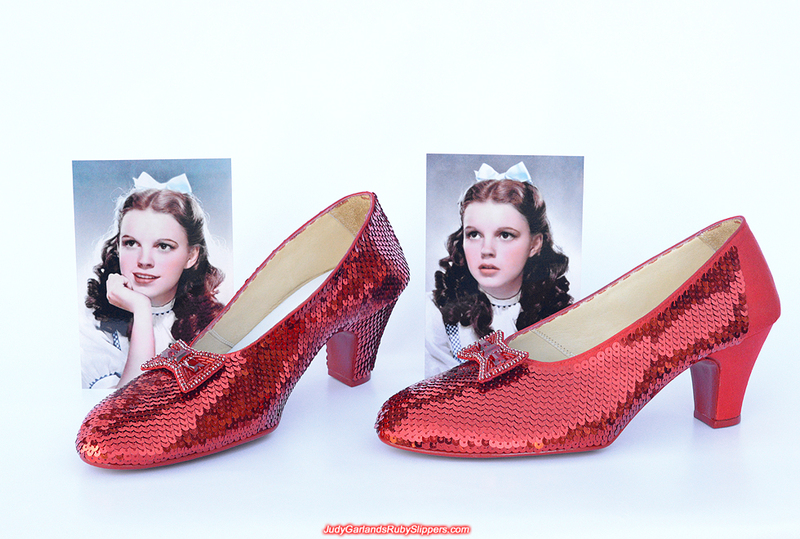 The shape and contents on the bows matches the originals. 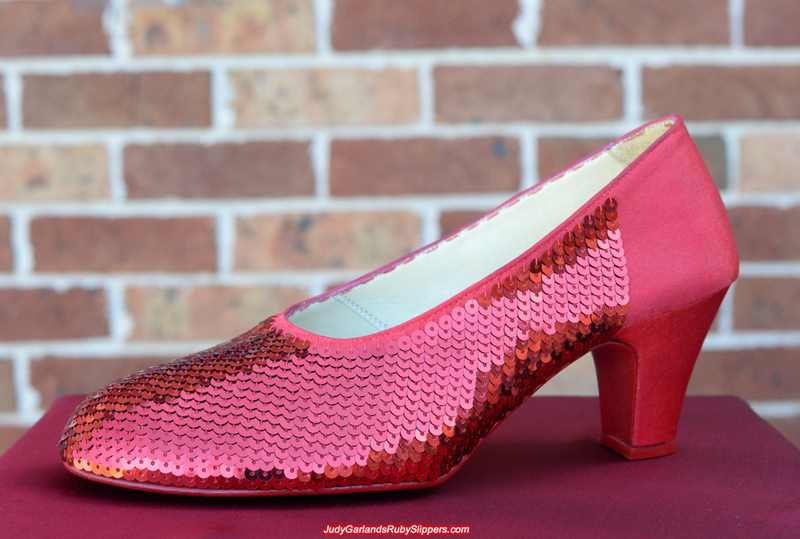 This is a beautiful pair of shoes handmade from scratch in women's size 8 US so you won't find them anywhere else. 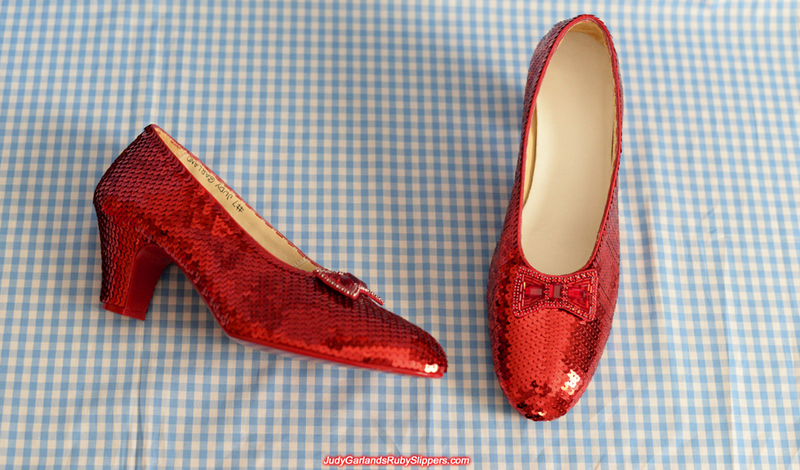 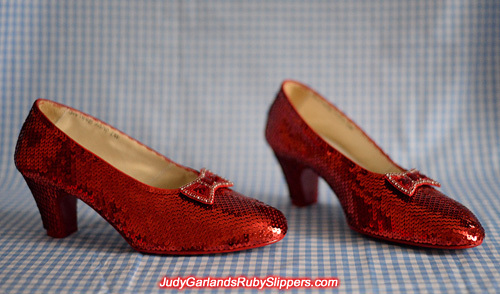 These are wearable shoes and the entire shape of the shoes from heels to toes matches the original ruby slippers. 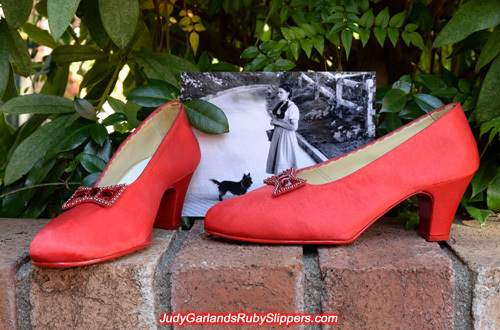 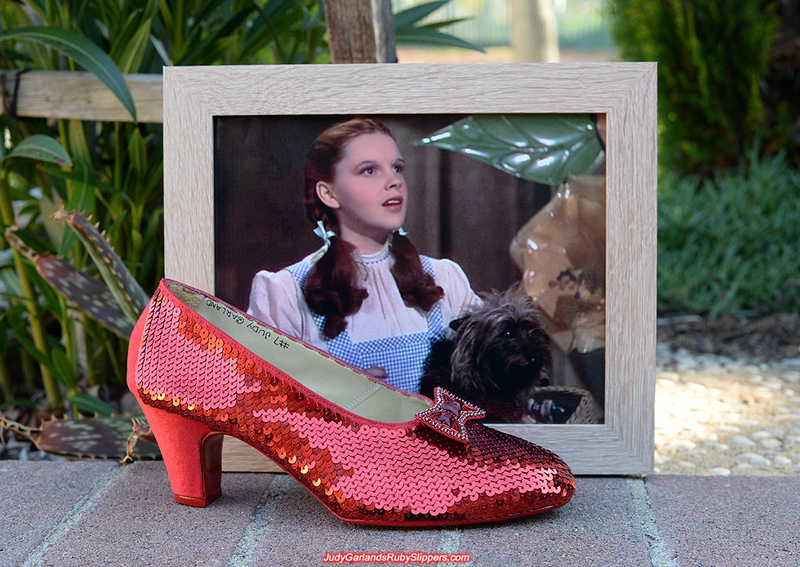 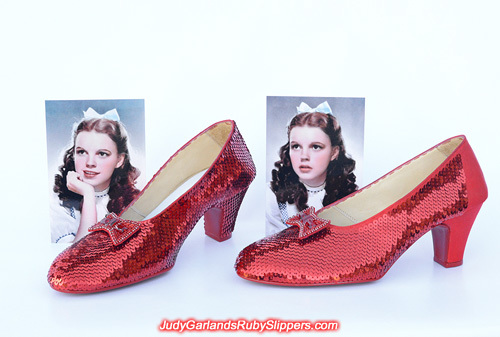 We painted the bottom of the shoes with high gloss red paint, and wrote "#7 Judy Garland" inside both shoe with a black fountain pen to match the original size 5B ruby slippers. 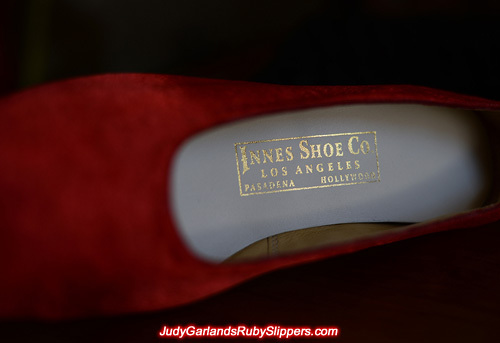 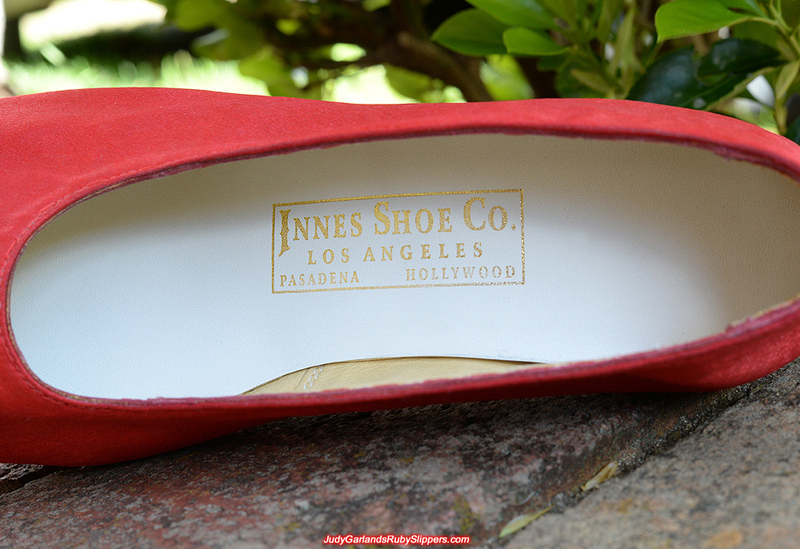 The right shoe contains a gold emboss logo that reads "Innes Shoe Co., Los Angeles, Pasadena, Hollywood". 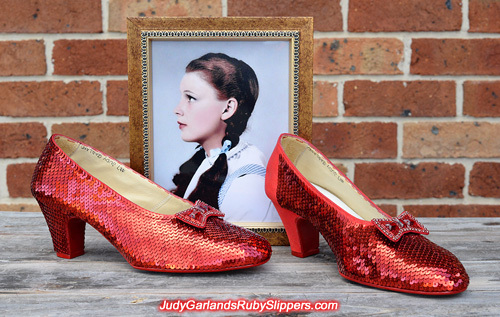 When it comes to high quality logos, it doesn't get any better than this, as used on the best pairs of the original ruby slippers. 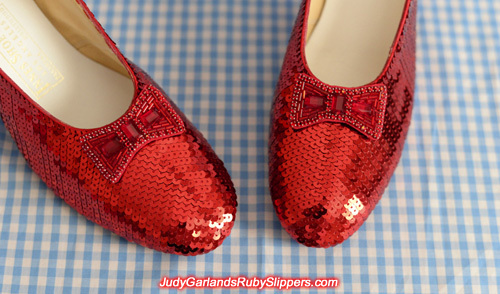 We are ready to sequin this magical pair of shoes. 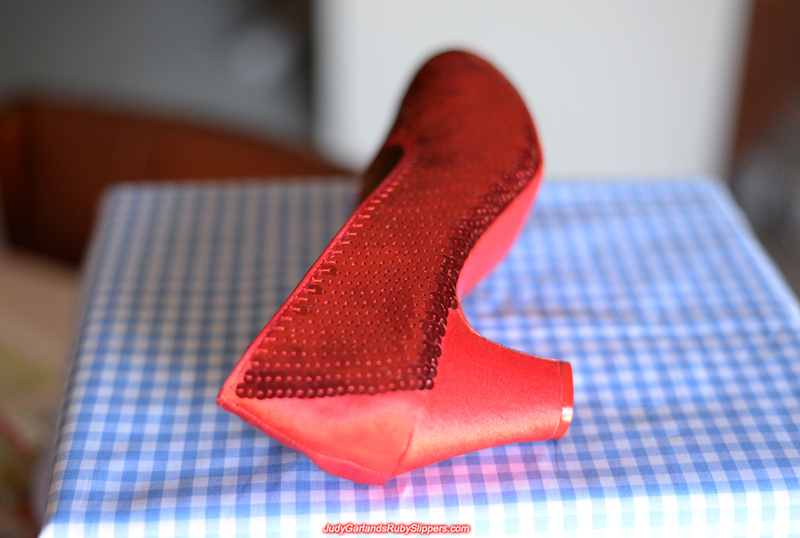 Sequining on the right shoe is in progress. 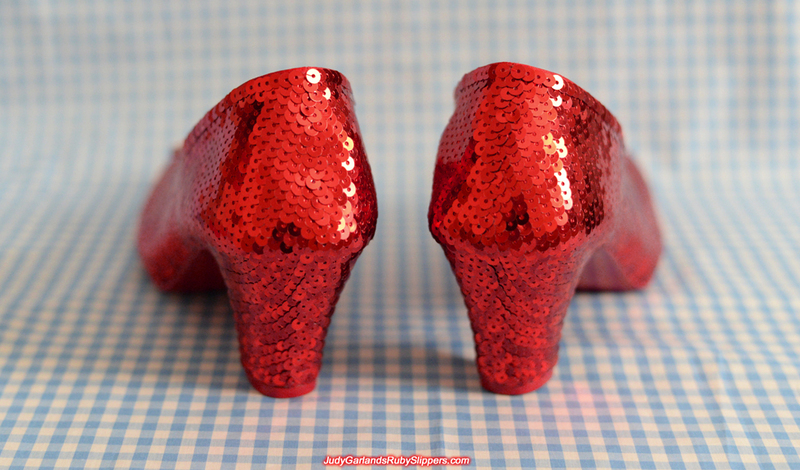 This pair of ruby slippers will be created to look brand new as they appeared in The Wizard of Oz. 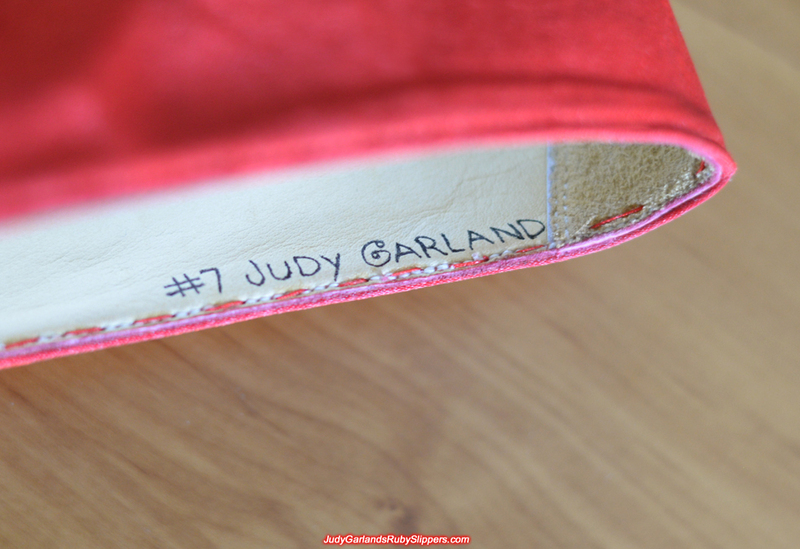 Red silk fabric is sewn onto the shoe, and red metallic sequins is sewn directly onto fabric attached to the shoe. 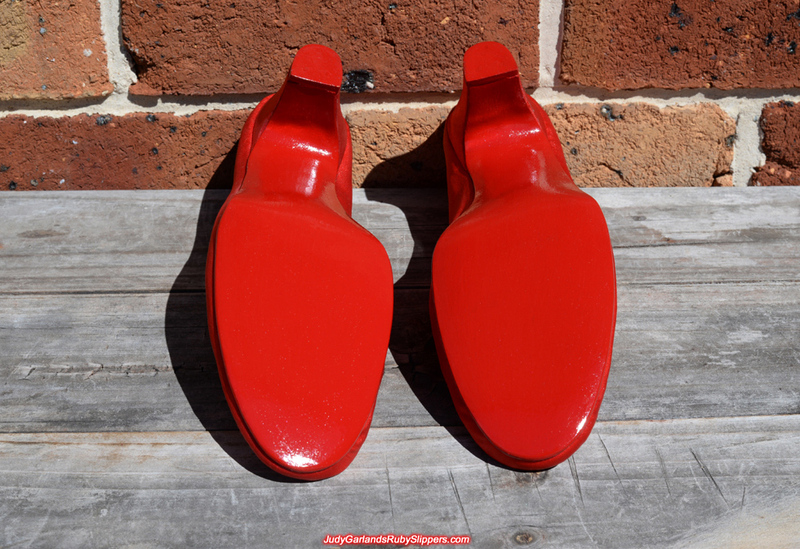 The right shoe is looking outstanding as we continue with our hard work. We are committed to delivering beautiful hand-sewn ruby slippers to all of our customers. When sewing the sequins, it takes a lot of care and concentration because we want to make sure the start and end of each column touches the edge of the shoe. We don't want a column of sequins to be too short otherwise you will see the fabric, and not too long otherwise you will have sequins hanging pass the edge of the sole and you won't be able to wear the shoes. 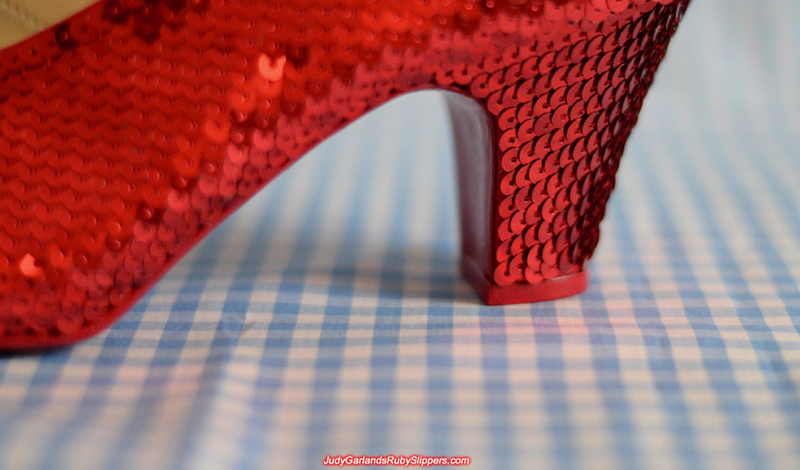 We also want to make sure the sequins are neat and firm in a fish scale pattern. Not only does this make the ruby slippers look presentable and high quality, but the sequins will remain attached to the shoe for many decades, or even centuries. 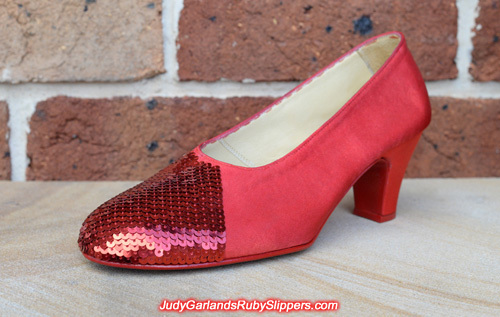 Two thirds of the sequining work is finished on the right shoe, and the bright shine of the sequins is beginning to appear. 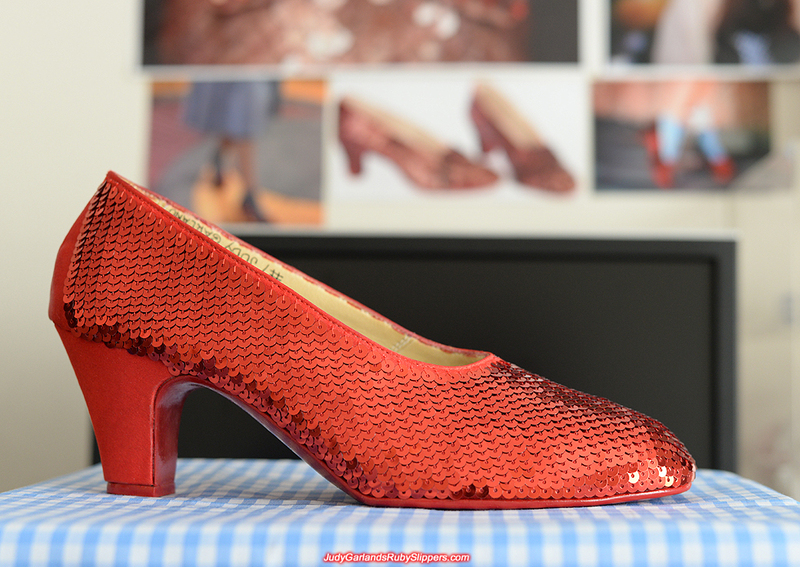 We have finished sequining the right shoe and the stitching looks very precise from the heel to the toe. Every sequin is carefully hand-sewn on a size 8 shoe with a straight needle so it takes some skill and a lot of time. If the right shoe is any indication to go by, the left shoe should be just as beautiful. Both shoe are together again as we continue our hard work with the left shoe. 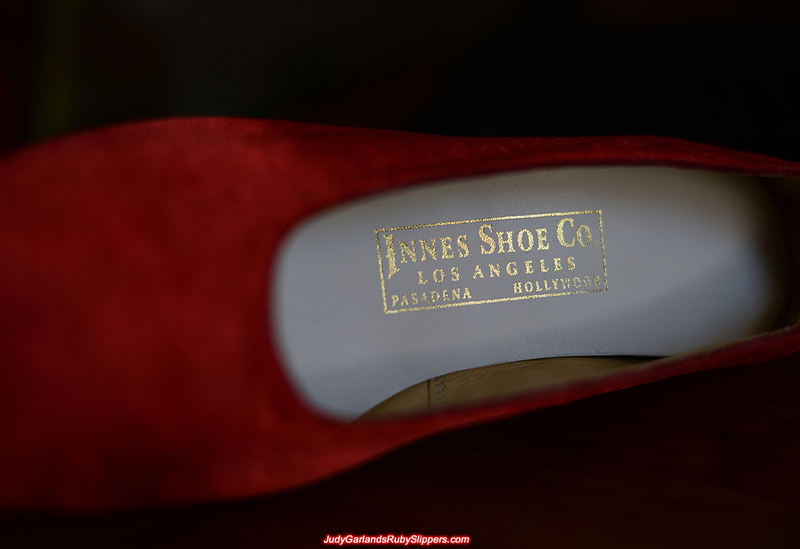 We'll keep this short and simple, perfection! 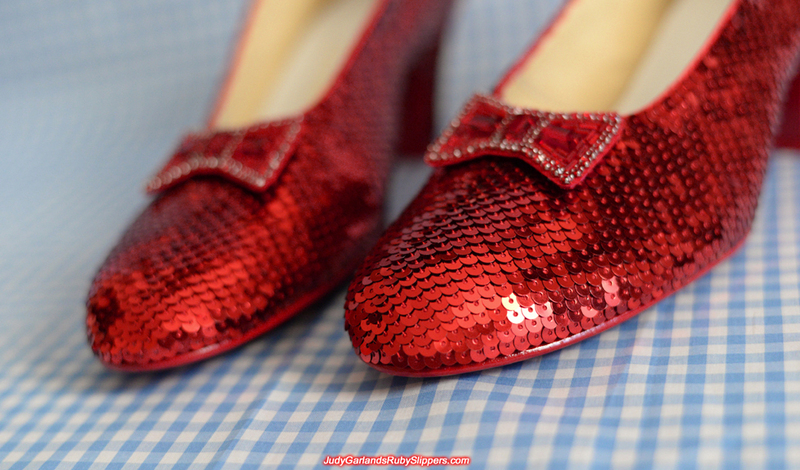 The ruby slippers are looking really, really impressive as we head down the home stretch with this project. What impresses us is the way the sequins overlap each other in an orderly fashion, very similar to tiles on a roof placed in a perfect pattern. 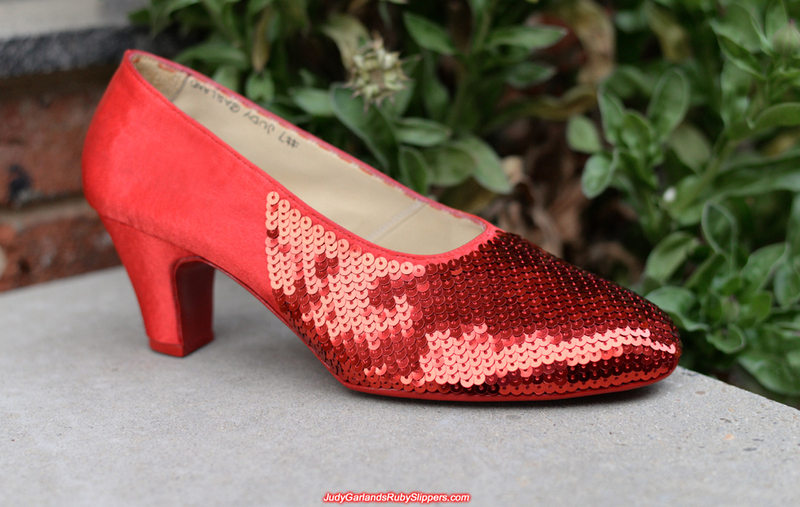 Truly exquisite sequining technique on show with this pair, ladies and gentlemen. 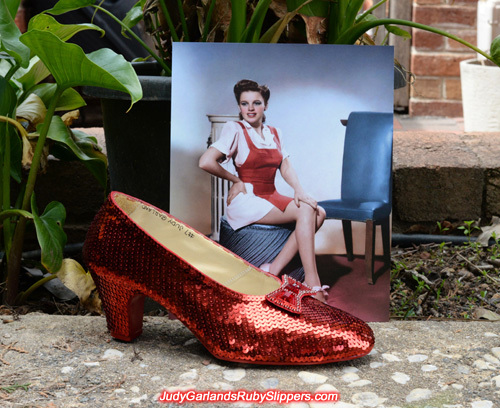 High quality, hand-sewn ruby slippers in size 8 have been completed and they are ready to be shipped to their new home.....and Judy Garland's spirit will follow them. 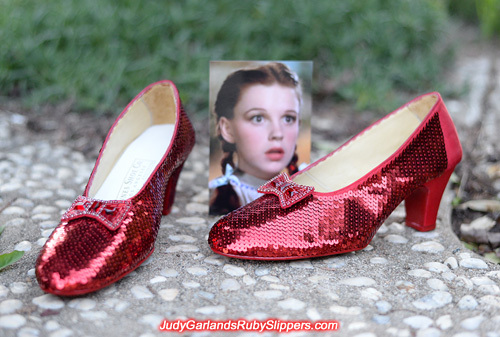 We hope their magic gives the new owner a happy and fulfilling life. 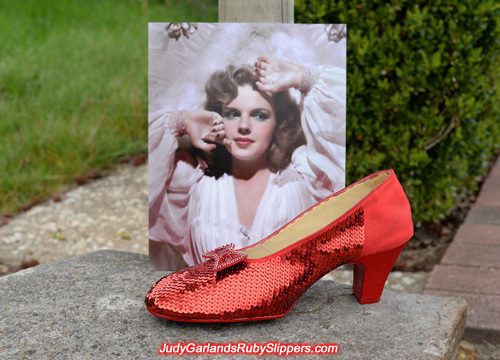 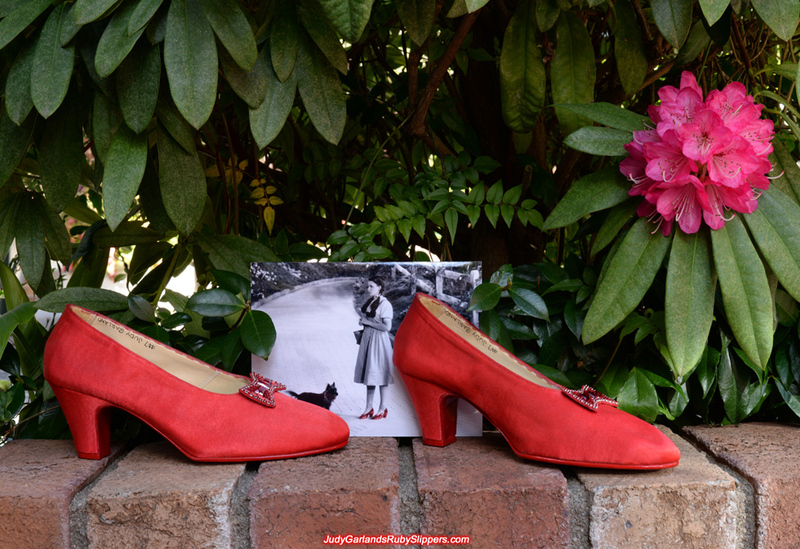 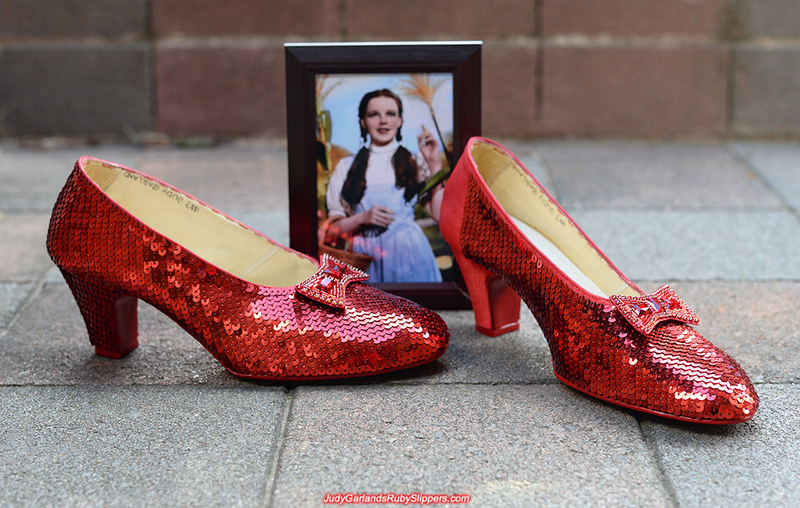 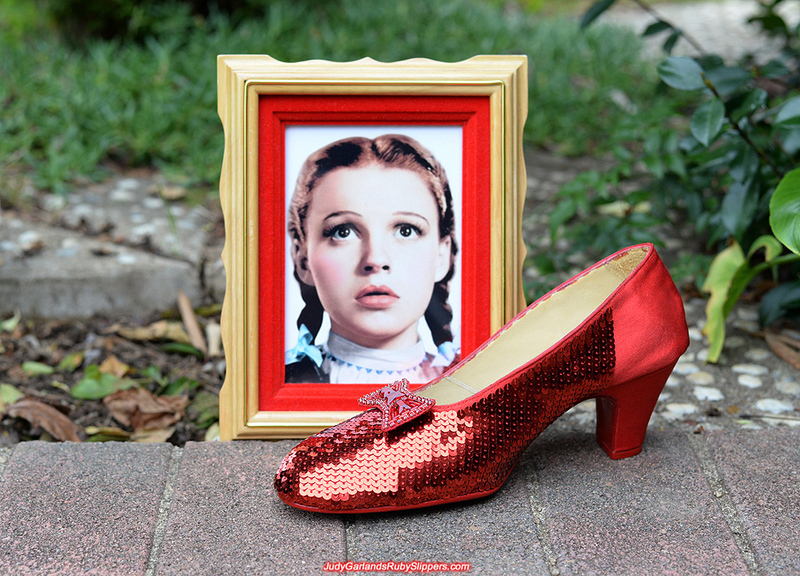 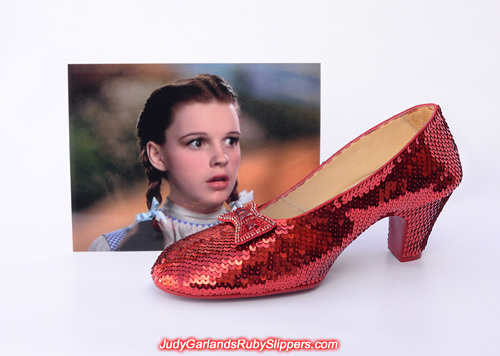 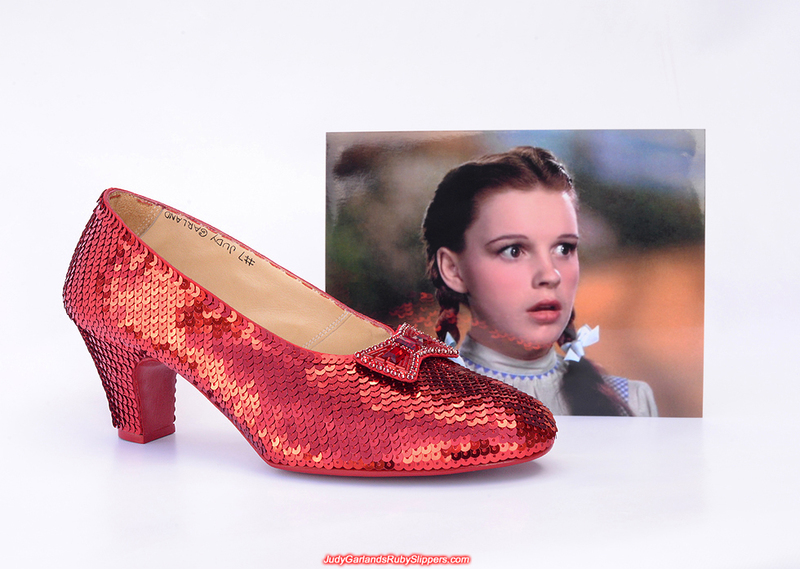 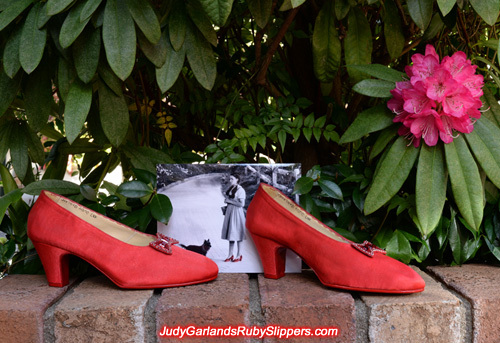 Please contact us if you would like a pair of ruby slippers in your size or Judy Garland's size. 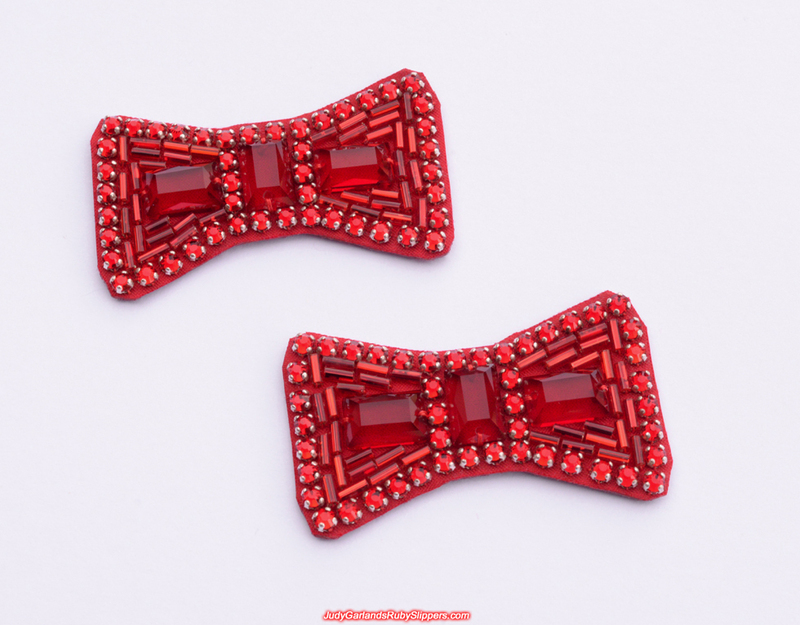 What occasions are you suppose to wear that too? 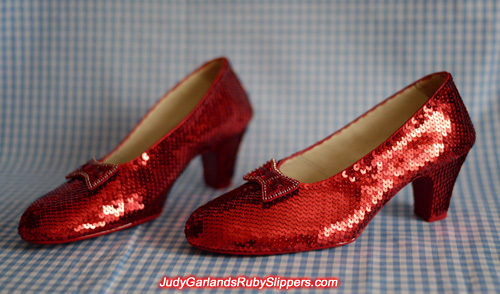 A dress up party is a good occasion, and we also make high quality ruby slippers for people to wear at their wedding. Another couple who will be getting married at the end of this year has requested a pair.